This modest extension to a cottage in the Scottish countryside was designed by architecture studio Sutherland & Co so the owners could invite their family to stay. 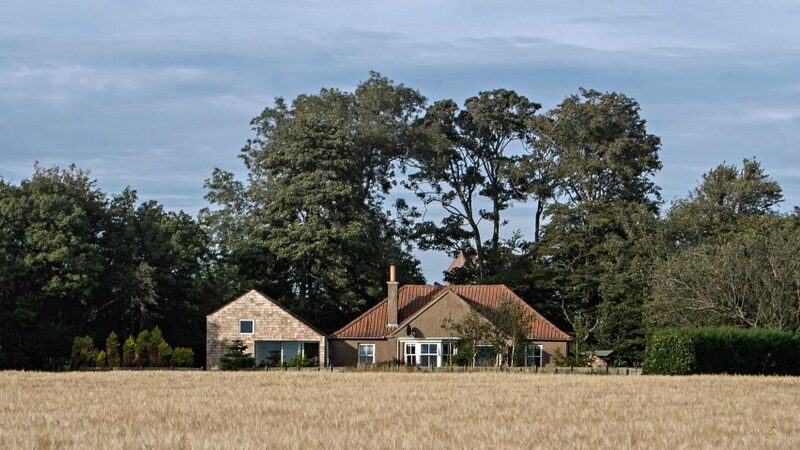 Featuring shingle-covered walls and a light-filled interior, the simple gabled extension – called Sydserf – adjoins the single-storey property in East Lothian, a county on the outskirts of Edinburgh. "Our clients needed a place apart from, but connected to, their small rural farm cottage, to accommodate visits from their grown children's young families," explained Sutherland & Co. The design is intended to match the old pebbledash-covered house, but to also have its own identity. To achieve this, it copies the scale and proportions of the existing gable, but features completely different materials and contemporary glazing. 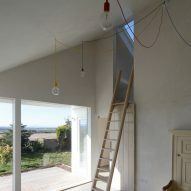 And while the old house has only one storey, the extension has two levels slotted beneath its angled roof. It contains a double-height living space, a separate entrance lobby, a bunk room, an elevated sleeping platform and a bathroom. "With a footprint of just 32 square metres, the extension is modest in scale but the internal volume is fully exploited to provide a spatially rich and varied interior," said the team. Cedar wood shingles clad the exterior walls and roof of the building. But a more pale palette was chosen for the interior, including exposed concrete floors, polished plaster walls and whitewashed wooden joinery. "Almost all of the materials used internally and externally are self-finished; only the windows frames are painted," added the team. 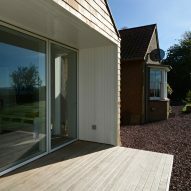 A large area of glazing connects the space with a patio deck in front of the building, allowing guests to sit outside and enjoy the view of the countryside. There are also skylights that allow daylight to filter into the shower area and the sleeping platform. Other quirky additions include a ladder leading upstairs, pendant lights with colourful flexes and a characterful wooden seat. 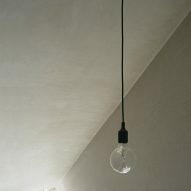 Led by architect Robin Sutherland, Sutherland & Co is based in North Berwick, on the East Lothian coast. Other contemporary houses and extensions completed in Scotland in the past year include an extension to a farmhouse in the Highlands, a self-built retreat on the Isle of Skye and a "box of tricks" home that was named RIBA House of the Year 2016.